Dry lightning occurrence is of critical importance to land management agencies since this type is most likely to cause wildland fires. Dry lightning is cloud-to-ground (CG) lightning without any accompanied rainfall nearby. Recent dry lightning research has concentrated on using upper air measurements--atmospheric stability and moisture content to predict dry lightning episodes in advance (Rorig and Ferguson 1999). Spatial products are needed to give managers an idea of where dry lightning has occurred immediately after the storms have passed. The Dry Lightning Maps are made by merging daily estimated rainfall grids, produced by the National Weather Services (NWS) Advanced Hydrologic Prediction Service (AHPS), with two polarity based lightning density grids, produced from daily cloud to ground lightning strike data (Cummings et. al 1998). A Lightning Fuel type grid converted from a cover type map (Schmidt and others, 2002) is used in the dry lightning cell calculation. The lightning strike and estimated rainfall data are adjusted for the 24-hour hydrologic day (ending at 1200GMT) used by AHPS. Two lightning density grids are created, one for positive and one for negative lightning strikes. All grids have a 4km pixel size in which the lightning fuel type grid is static and the lightning density and estimated rainfall grids are recreated daily. A dry lightning cell exists when it has met three criteria: rainfall less than 0.10in (0.25in for the Southern and Eastern map), fuel (not classified as barren, urban or water), and a positive or negative cloud to ground lightning strike. Dry lightning cells are displayed based on strike polarity. If both positive and negative strikes occur in a cell, the cell is classified as "positive". Two maps are displayed. 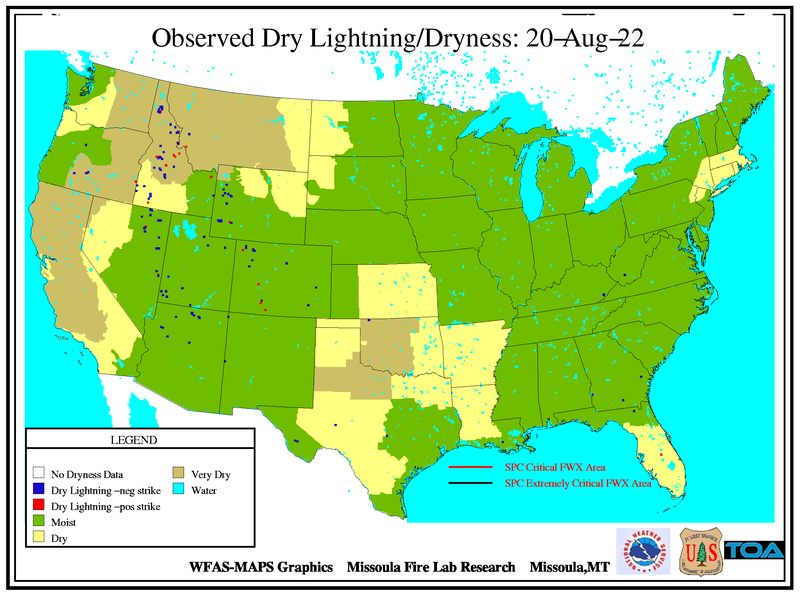 One shows dry lighting cells overlying the 24 hour estimated rainfall while the 2nd displays the dry lightning cells overlying the current fuel "dryness" levels (http://www.predictiveservices.nifc.gov/outlooks/7-Day_Product_Description.pdf). Moist (Green): Indicates a burn environment which has historically resulted in a very low or no probability of new large fires or significant growth on existing fires, even when accompanied by critical weather events. Dry (Yellow): Indicates a transitional burn environment that typically results in low probabilities of new large fires or significant growth on existing fires unless accompanied by a critical weather or ignition trigger event. Very Dry (Brown): Indicates a very dry burn environment which has historically resulted in a higher than normal probability of significant fire growth and new fires, especially when accompanied by a critical weather or ignition trigger event. Areas that the Storm Prediction Center have delineated as a significant threat for wildfires where pre-existing fuel conditions combined with weather conditions such as wind or relative humidity create a “Critical” or ‘Extreme” Fire Weather Area are also shown. Critical Fire Weather Areas for wind and relative humidity are issued when strong winds (>20mph) and low RH are expected to occur where dry fuels exist. Extremely Critical Fire Weather Areas for wind and relative humidity are issued when very strong winds and very low RH are expected to occur with very dry fuels. Dry lightning cells within these areas should be given close scrutiny since they have a much higher likelihood of igniting a wildfire. There are regional differences in the the definition of a dry lightning strike. Maps are available based on Geographic Area Coordination Center (GACC) boundaries. The Eastern and Southern area maps have a rainfall threshold for a dry lightning event of 0.25 inches or less. All other regions use an estimated rainfall threshold of 0.10 inches. Rorig, M.L. and S.A. Ferguson, 1999: Characteristics of lightning and wildland fire ignition in the Pacific Northwest. J. Appl. Meteor., 38: 1565-1575.